Whether you already own an air fryer and want to upgrade to something bigger or you’re looking to buy your first air fryer, we’ve hand-selected a few of our favorites based on features, quality, and reviews. Small air fryers, which generally are about 3 quarts, are not enough, especially when you start talking about main dishes. Large air fryers are going to be around 5 to 6 quarts. If you have a family larger than four people, you might even want to explore an extra-large, which can have a capacity of 8 quarts or more. In this article, we’ll talk about why spending a little extra cash on a larger air fryer is worth it. How Much Does a Large Air Fryer Cost? How Much More is a Large Air Fryer Compared to a Smaller One? Is a Large Air Fryer Too Big for a Small Family of 2 or 3? A large air fryer is going to cost between $100 and $300, depending on the unit. The moment you want to start getting the different bells and whistles, it will drive the cost up. With such a variety available on the market, you get to choose something that fits well within your budget. If you simply want an air fryer, you can find one for as little as $100. If you want a few extra features to simplify your time in the kitchen, you can spend a little bit more to get a higher-end model. Either way, you get the same air circulation technology to get an even cook without using a lot of oil. A small air fryer will generally cost between $59 and $129 depending on the manufacturer and the features. A large capacity one, such as the Philips Original, is around $150. This means that you’re only spending about $20 to $50 more in order to double the capacity. You have to be conscious of how much capacity you actually need. With a family of four, it is going to be more cost-effective to spend the extra money to get a larger air fryer. Even if you have a smaller one now, you can invest to get a larger one and find that it provides you with many more uses. You won’t have to batch cook everything, which saves you time and aggravation. The reality is that bigger really is better in this scenario. Many families make the mistake of assuming that they will only use the air fryer for traditional fried foods such as chicken and French fries. 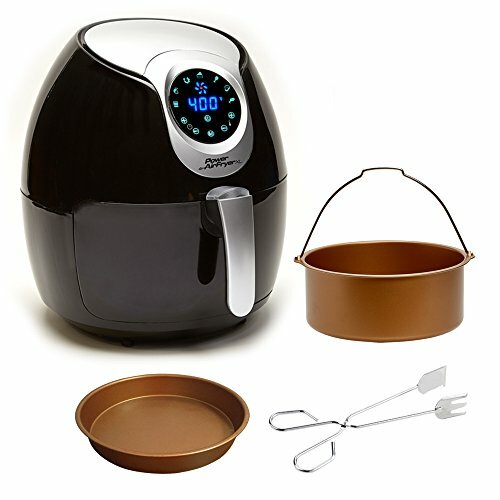 Once you start exploring the different recipes and get a few of the accessories to expand the use of the air fryer, you will be using it for many other foods. You will have the ability to cook a wide array of foods inside of an air fryer, ranging from appetizers to desserts. The larger size will provide you with options to cook for your whole family, cook more foods at once, and even have leftovers from time to time. You will find that there are quite a few benefits to having a large capacity air fryer for your family. It’s then easier to make the investment on this kitchen gadget. Food is going to cook faster in a large air fryer because you won’t have to worry about overcrowding the ingredients. The moment you start to place too much into a fryer basket, you prevent the airflow. This will have a significant impact on the cooking time. With more room inside the basket, the food gets the heated air that it needs to cook through. That’s when you can also start taking advantage of the presets that many units offer, making it easier to cook your favorite foods without spending a lot of time in the kitchen. A larger capacity is going to allow you to cook more food. If you currently have a small air fryer, you are going to virtually double the size of the fryer basket. You will have the ability to fit a whole chicken or even a half rack of ribs into the air fryer, too. Many of the units will be able to cook up to four pounds of food at once. You will find that a large fryer is going to be a better value in comparison to a small air fryer. It may only be $20-$50 more to upgrade to a larger size. This means that you have the ability to double the capacity without doubling the cost. You can also utilize your fryer as another cooking source in the kitchen, such as alongside a toaster oven or range. Plus, many units have add-on accessories that allow you to cook other types of food in your air fryer. Larger units allow you to cook multiple foods at once. For example, you could cook an entire steak and still have room for potatoes and brussel sprouts. Extra accessories will also allow you to get racks to place inside of the unit. This would allow you to layer your food in order to cook several items at once, making it easier to multitask inside the kitchen. There are a lot of large air fryers on the market. A few are identified below, showing off the ones that have some of the best key features. What you need for your family might be different than someone else’s based on your desire for simplicity or cooking more food. Review the fryers to see which one will suit your need the most effectively. 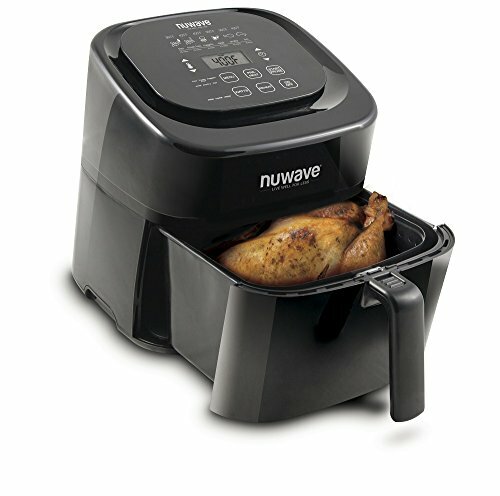 The NuWave 6qt Digital Air Fryer features a large capacity for baking, roasting, grilling, broiling, and even toasting alongside the standard air frying. The basket is easy to remove and there is a non-stick coating on it. The temperature setting goes up to 400 F, allowing you to cook many foods. The unit has a sizable footprint at 16.9 inches by 13.4 inches and has a height of 15.8 inches, which might make it difficult for you to find room to store it if you are limited on space. Many reviewers talk about how easy it is to set up. Additionally, there are various accessory kits that you can buy separately to increase what can be cooked inside. It’s priced mid-range, which ensures you get the value for your money. The Philips XL Airfryer is our favorite, providing a lot of technology to use for a better cooking experience. There is a smart preset button that will memorize the setting for your favorite food. A digital touchscreen also allows you to customize settings so that food cooks exactly to your liking. The 2.65-pound cooking capacity also allows you to have plenty of room to cook for a family of four. A removable nonstick drawer and food basket are dishwasher safe, keeping cleanup to a minimum. Various branded accessories are available, plus the unit comes with a free app, which contains 150 recipes. The unit is on the high-end of large air fryers, though it also has a smaller footprint with an 11.9-inch height, making it easy to slide under your countertop. It’s worth the extra cost to get this premium air fryer. The replaceable basket has stainless steel mesh. There’s a patented start design as well as various accessories, including pizza pans and racks. It also has the best warranty on the market. Philips has had an air fryer for five years, so they have something that none of the other brands can boast. The Elite Platinum 5.5 Quart Electric Digital Air Fryer offers advanced touchscreen technology and seven menu functions. The temperature goes up to 400 F, allowing you to cook an array of foods. A full-color recipe book includes 26 healthy recipes to get you started, too. The non-stick coated fryer basket is dishwasher safe, as is the drawer pan. As for the exterior of the unit, it can be cleaned with a damp cloth. A cool touch handle also allows you to remove food without fear of being burned. You can cook up to four pounds of food in a single basket. Plus, there is a 60-minute timer that will shut the air fryer off automatically when the cooking cycle is complete. The Power Air Fryer XL fries and cooks almost everything and is designed to feed a family of four to six (though a larger capacity is recommended for six people). There are seven present programs with one-touch digital controls. The whole unit is easy to use and the 6-in-1 cooking technology allows you to fry, bake, steam, grill, sauté, and roast, all with little to no oil. A cool touch easy grip handle makes it safe to work with. Plus, the nonstick coating on the 5.3-quart basket provides an easy cleanup. The Power Air Fryer XL is the most popular of large air fryers. It offers an accessory kit with cooking tongs, baking insert, and pizza pan. It is easy to use and a lot of positive reviews are available, demonstrating that it is a reputable product. Cook’s Essentials 5.3 Quart Digital Air Fryer is one of the more affordable units in its class. It comes in several colors and has a small footprint of 12 inches by 16.5 inches. There are 10 preset functions, allowing you to cook steak, French fries, chicken wings, bacon, and other foods at the press of a button. The unit also features a 30-minute timer, an LED display, and a removable fryer basket. The Cook’s Essentials Digital Air Fryer is certainly the one with the best value, especially because it comes with a pan that is usually sold separately with other units. A recipe book with 30 recipes is also included, as well as a one-year limited manufacturer’s warranty. You can fry virtually everything inside of the fry basket or cake barrel pan, making it a great tool for your kitchen. A large air fryer is certainly the way to go to get a better value for your money. You can have more space to fry things without overcrowding the food. The Power XL is a favorite because of the seven presets and the 3-piece accessory kit that you get at no additional cost. 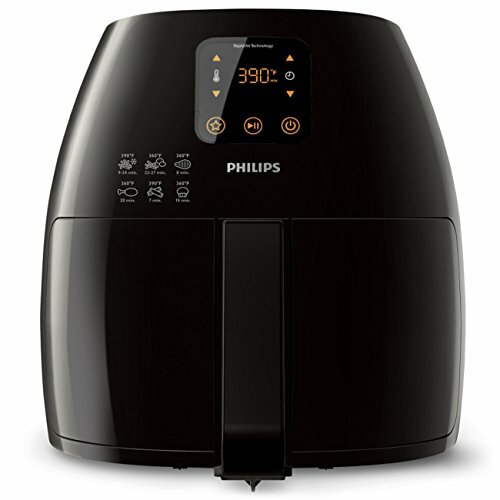 The Philips XL Airfryer is the best on the market, with the best warranty and highest quality. It’s the only air fryer with stainless steel, replaceable baskets, too. If you have it in your budget, this is the model you will want to go with. Regardless of which fryer you decide to get, you won’t go wrong by getting a five-quart unit or larger for your family. Everyone will love the food you make with it, from chicken wings to chocolate cake! Have you been looking at an air fryer big enough to cook for the whole family? With bigger families comes the need for an extra-large capacity air fryers. In this article, we can help you to overcome the limitations on the market and make some recommendations. There are a lot of benefits to using extra-large air fryers. In addition to it being a healthy cooking option, it can be a great gadget for the kitchen. Air fryers that are six quarts and larger will give you the cooking capacity needed to cook for families of four, six, and even more. It ensures that you’re able to cook a whole chicken, 20 chicken wings, or even a two layer cake. Depending on the accessories you get, you can cook more than one item in the fryer at a time, too. Larger air fryers provide you with the flexibility to cook new and different items. You might choose to cook a ham, a rump roast, a rack of ribs, or a chicken inside. Depending on the size of your fryer and how many you’re cooking for, there might be room left over for potatoes, a vegetable, or something else of your choosing. You will find that there is a lot of compatibility with the larger ovens in terms of using pans that you already have in your cupboards. An 8×8 glass Pyrex pan will usually fit inside. If you’ve got the right pan, you might even be able to use a 7 or 8-inch cake pan inside of it. 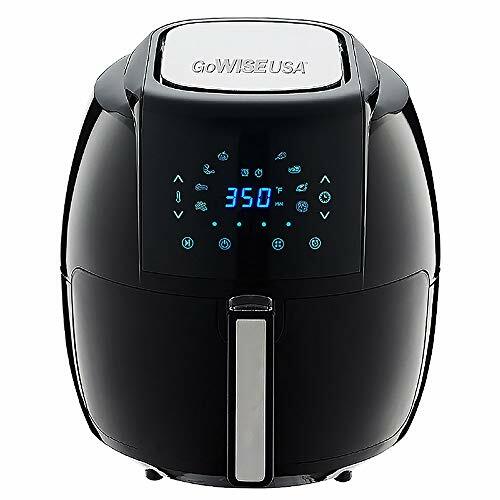 This will ensure you’re able to cook all sorts of foods without investing a small fortune in accessories that are made specifically for the air fryer. Part of your frustration with buying an extra-large capacity air fryer might be the selection. There are only about three or four models currently on the market. With the popularity of air fryers, it wouldn’t surprise us if there is a trend towards more and more in a very short period of time. Right now, air fryers in this category will often overlap with countertop convection ovens, which is actually the better route to go. It’s important to know about the better alternatives. A convection oven is technically an air fryer. It’s a better option because there is more technology incorporated into the models currently available. A countertop convection oven is like a miniature oven that sits on your countertop. It has similar air fans to an air fryer, which means you can still fry with little to no oil along with bake and broil. They have about the same footprint as an air fryer, which is around 17 inches by 13 inches and then 12 inches in height. The average cost is going to be between $100 and $200, with some models being much higher depending on the size you want to have in your kitchen. Good Housekeeping has recommended countertop convection ovens for years as a sanity saver. We highly recommend the Oster Extra Large Digital Countertop Oven. It offers even heating, digital controls, easy cleanup, and a 90-minute timer with auto shut off. It also has enough room inside for two large pizzas thanks to the two oven racks. Review the top extra-large air fryers on the market to see what works best for you. Gourmia GTA2500 is an air fryer, griller, and roaster all-in-one. An interior liner is nonstick and removable, making it easy to clean. It also comes with 11 different attachments to add versatility to the unit. The digital controls on the front make it easy to set the temperature and timer. While it doesn’t come with a recipe book, it does allow you to make everything from rotisserie chicken to beef kabobs to pizza inside of the unit. The XL size ensures you’re not limited by space. At 19 pounds, the unit is large. It fits comfortably on a counter and will allow you to cook for the whole family. The Todd English 1500W Multi Function Digital Air Fryer has been very popular and comes in several different colors. The set includes the air fryer, a recipe booklet, as well as pans, racks, and baskets to cook more food. A digital touch screen makes it easy to set the cook time and forget until the timer goes off. A 5.8-quart basket also delivers a large capacity to air fry, broil, roast, bake, and toast food. 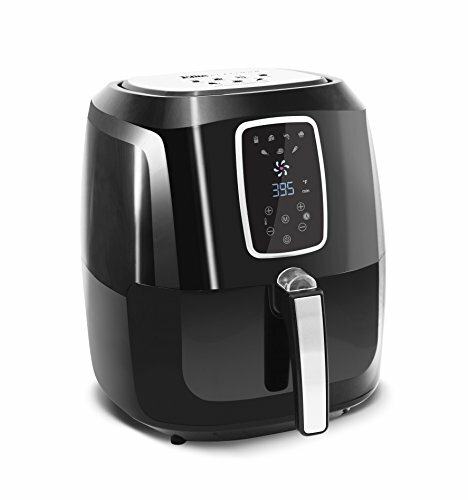 The 1500-watt air fryer offers a rotation function and an interior light to check on food. Plus, there’s a one-year limited warranty. The Big Boss Oil-less Air Fryer is budget-friendly and uses three cooking powers: halogen, convection, and infrared heat. There are two trays, making it simple to cook two foods at once. The 16-quart capacity allows you to cook a significant amount of food at once. Features include multiple temperature settings, a timer, and food icons to distinguish the temperature needed for cooking different types of food. The air fryer comes in six different colors. It’s also packed with a recipe booklet to provide inspiration on what to cook inside of the unit, ranging from chicken wings to fish to dried fruits. There are positive reviews about the air fryer, including how well it fits on the countertop. Explore the different countertop convection ovens to provide you with the airflow technology and capacity needed to cook healthy meals for the family. The Oster Extra Large Digital Countertop Oven uses convection technology with two racks on the inside. There is a durable bake pan and a broil rack is integrated into the oven. An easy clean interior keeps cleanup simple after meals are made. Temperature settings go up to 450 F to bake, defrost, and toast different foods. The Oster brand also comes with a reputation for high-quality kitchen supplies, providing you with confidence that you’re making a good investment. A stainless finish adds a decorative touch to the kitchen. Convenience is also offered in a 90-minute timer with auto shutoff. Customer reviews are high, talking about how easy the convection oven is to use. It’s also something that fits well on a countertop at just under 13 inches high. The Breville Smart Oven Pro Convection Toaster Oven includes 10 pre-set cooking functions to make it easy to bake, roast and broil everything from pizza to cookies. An interior light allows you to check on cooking progress while a nonstick cavity allows for a simple cleanup. Two heat settings allow slow cooking up to 10 hours. The convection toaster oven has a capacity of a 13” pizza or six slices of toast. There is also an auto-eject rack to make it simple to take out hot food. It’s only 11 inches high, making it easy to slide underneath cabinets. Ultimately, you want an air fryer that allows you to cook in a healthy way for the whole family. Although there are good air fryers on the market, you’re limited by the small selection of air fryers currently available. We recommend a convection oven because of what it’s capable of. We recommend the Breville Smart Oven Pro if your budget allows. The 10 pre-set cooking functions keeps it simple and you have plenty of room inside for a large protein to feed six or more people.